Crush grated coconut, cumin seeds, chilli powder and garlic cloves together and keep it aside. 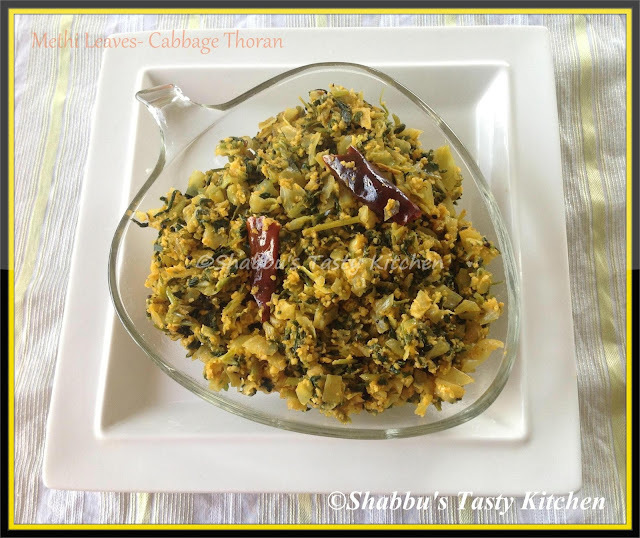 In a bowl, mix methi leaves, cabbage, turmeric powder and salt. Heat oil in a pan and splutter mustard seeds and urad dal and add dry red chilly. Add methi leaves- cabbage mixture and sprinkle little water and cook covered till done. Very informative n can win prizes too..
U may b d lucky winner 2day !!! Hurry !! loved the addition of cabbage. methi and cabbage, I have not tried Shabbu... looks very nice..
good combination. healthy too ! thats a new combo ! looks delicious ! beautiful combo,never tried this ....nice clicks. Wow! That dish looks very inviting! I love collecting recipes of stir fry because it's very delicious and tasty. I would like to try this so that I can eat a lot and add it to my cook book. Anyway, thanks for sharing this.